Welcome to the December 2015 issue of the AXIe Newsletter. Our AXIe Consortium LinkedIn membership numbers continue to increase and we are now a community of over 335 members. If you want to stay abreast of the AXIe standard you can subscribe to the new AXIe consortium YouTube Channel, or view the latest AXIe-0 Overview presentation on the website. Your test goal is to quickly capture many different signals generated from an event and re-construct the data for review and analysis. Timing and synchronization of the signals must be perfectly aligned in order to properly reconstruct the original event. Some signals may require further processing or conversion such as those acquired through transducers. How do you ensure test results are accurately captured? The challenges of complex high-speed multichannel acquisition systems are discussed further in this article. When collecting large amounts of data to reconstruct real-time and fast transient or single-shot events engineers face several test challenges. Selecting the best instruments to construct a reliable test system for data collection is most important. Capturing multiple real-time signals generated during the event requires a high-speed digitizer that can make many very fast, accurate measurements. The performance of the digitizer determines the quality of the signal measurements, with accurate triggering and timing across all the channels to ensure reliable reconstruction of the acquired data. 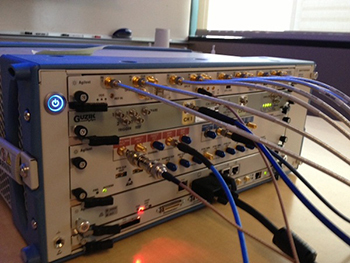 Channel synchronization can become an even greater challenge as the number of monitored signals grows, requiring a complex multi-channel test system configuration. 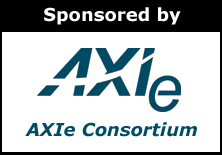 Earlier this month, the AXIe Consortium added new capabilities to the AXIe Base Specification. If you are unfamiliar with AXIe, it is a modular instrument standard best described as the “big brother to PXI.” Like PXI, it hosts pluggable instrument and controller modules into a chassis, using PCIe (PCI Express) as a high-speed data fabric. However, the modules are larger than PXI and typically placed horizontally in a chassis. These larger modules allow power dissipation up to 200 watts/slot, suitable for high-speed data converters and digital test. You can read my recent AXIe tutorial here. Like PXI, AXIe allows instrument modules from multiple vendors to be inserted into the same chassis. The larger module form factor combined with horizontal orientation allows very high power and rack density.